Experienced game developers have confirmed the formation of a new independent studio named Renown Entertainment Inc. in Vancouver. Founded in 2009 by James Lau and Bill Li, the company will develop, publish and distribute interactive entertainment for video game systems, wireless devices and online. President and Creative Director, James Lau, brings more than a decade of experience in the games and visual effects industries to drive the direction of the studio and game development. It is with these philosophies that Renown strives to transcend the artistic and technical aspects of game development to create truly rewarding interactive experiences. Renown will launch their first game, Waves: Survivor, in October for the iPhone® and iPod Touch®. 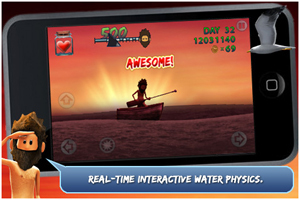 In this debut game, gamers will be challenged to see how many days they can survive in a rowboat while lost at sea. Obstacles will include riding huge waves and fending off dangerous creatures like the electric jelly fish and hungry sharks. 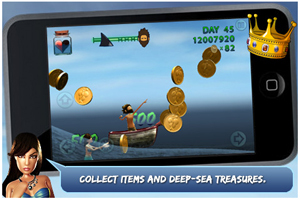 Your character will also require some strong swimming skills as gamers build up their collection of deep-sea treasures and celebrate achievements by rockin’ out on their paddle guitar. Waves: Survivor will also featuring leaderboards (via Facebook and Twitter), interactive water physics, continuous survival gameplay, touch and accelerometer controls, collectible items and more. Renown Entertainment’s second game (currently referred to as iOS Game D) is scheduled for released this winter. It would appear from the studio’s game listing that they are also working on a Triple A title for console and PC gamers. This entry was posted on Wednesday, September 29th, 2010 at 9:05 am and is filed under Business News, Casual, Everyone, Mobile, National News, Studios, Upcoming Releases. You can follow any responses to this entry through the RSS 2.0 feed. You can leave a response, or trackback from your own site.